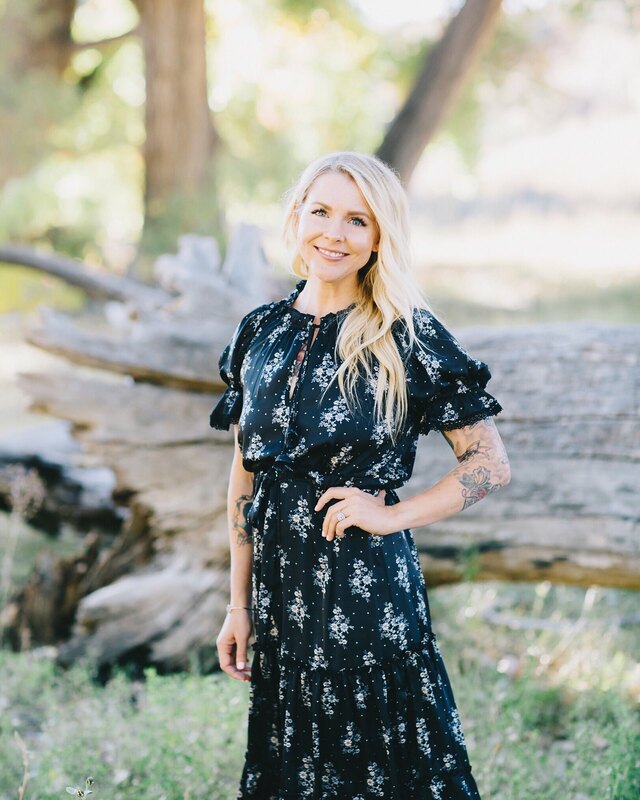 Occupation: Mama of two beauts, a homemaker and certified personal trainer. Age of first tattoo: I had just turned 18 and was excited about being able to get tattooed, I ran into my local tattoo shop and got a star on either wrist, ha. Both now being some what covered by other pieces. Favorite tattoo: I would have to say my latest hand/forearm piece I recently got done a few days ago after nine months of pregnancy (which is not complete as yet). It's a 'time for tea' theme with an antique teacup on my hand with a rose blooming from the top, followed by an antique teapot on my forearm with a deer head popping out and also some antique spoons. 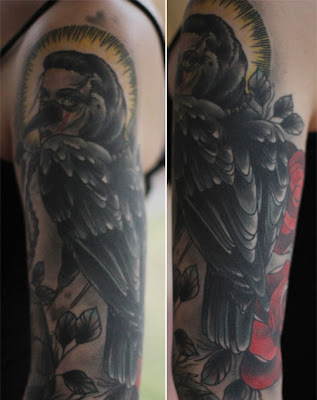 Looking forward to finishing this piece, done by my darling partner, Jai Kirchen of Raven Tattoo in Sydney. 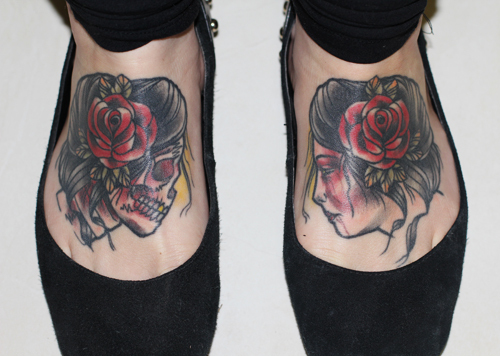 Featured tattoo: I decided to feature my feet tattoos which were done by Jasmin Austin of WA Ink, Fremantle, Western Australia. Not many of my tattoos have a background story or special meaning, my feet were simply a spontaneous thought. I had come across this specific artist work and decided to make the two hour drive to book in. I explained what I was after and approved of the line drawing the day of sitting. 2) Do you have any other tattoos? 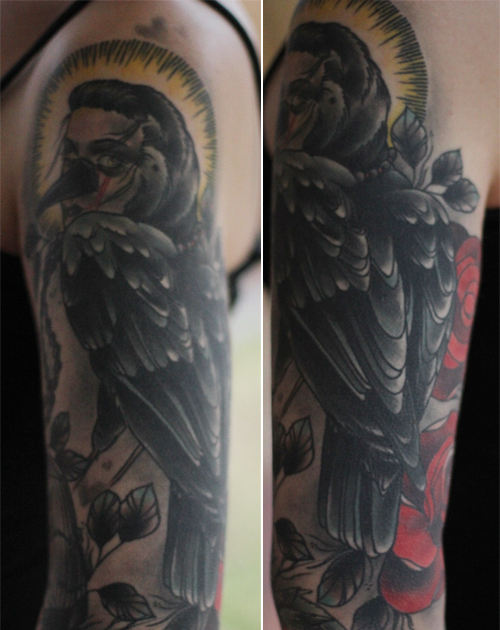 I have my left arm and hand done (pictures below). I also have the back of my neck which is a rose with a diamond blooming, I have a thigh piece which is an antique Victorian hand held mirror with an all seeing eye in the mirror glass with a couple of roses. I do actually, I am trying to limit myself though as I would love to continue to get big pieces by various artist instead of the one artist. Our lil' family plans to travel within the near future so I am saving myself, so to speak. 4) How do your family and friends feel about your tattoo(s)? Family and friends are supportive of my life choices, my partner is a tattoo artist so our lil' family is around the whole tattoo thing a lot, it's nothing out of the ordinary to our eldest kiddo. Although I have ran into negativity while out and about but it no longer bothers me if it happens now, tattooed or not, you will always run into judgmental people. I am who I am and my tattoos do not define me as a person. From my experience I would say to definitely think about what you want, don't rush into it and definitely find an artist whose work you admire. they are an adorable family. those kids are too cute! Love the pieces on her feet!!! most of my tattoos are black and gray but it really makes me want more pretty colors! 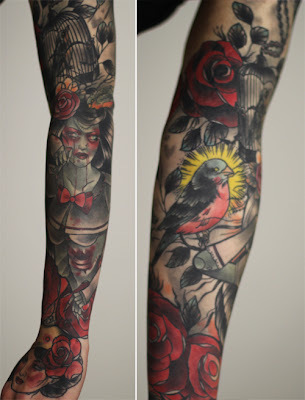 this is my favorite tattoo tuesday post so far! 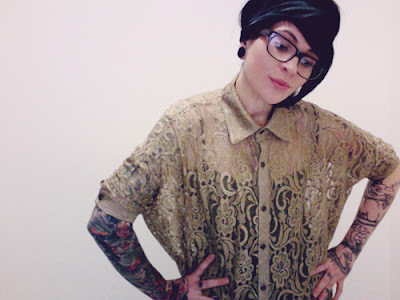 gorgeous girl, gorgeous tattoos! LOVE this. Now I have a new blog to follow! 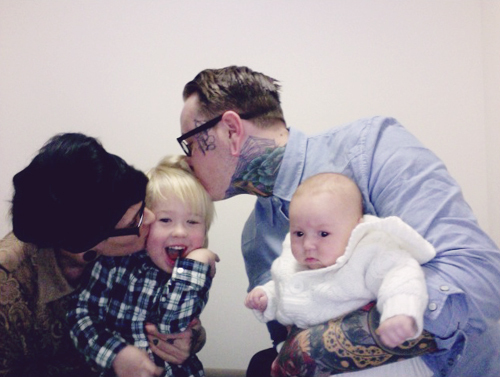 Such a cute family and Rad Tattoos! I like Tattoo Tuesdays! Wow, those tattoos are stunning. This is a great Tattoo Tuesday. Off to check out her blog, thanks for introducing her to us! Such an adorable lady! oh i love her arms! So pretty! !